Open this beautiful gift book and follow the Festival of Lights through place and time—from Herod’s temple to a shtetl in Russia; from a refugee ship bound for the New World to an Israeli kibbutz. 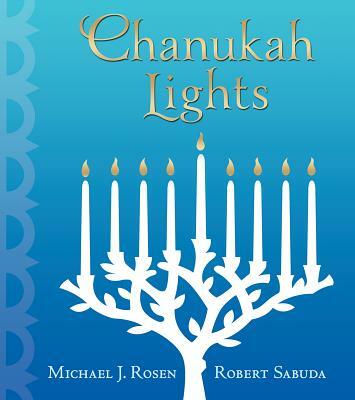 Inspired by Michael J. Rosen’s reverent poem, Robert Sabuda’s striking pop-ups depict each night’s menorah in a different scene, using such imagery as desert tents, olive trees, and a final panorama of skyscrapers. Sure to be a treasured family heirloom, this stunning collaboration showcases the spirit and resilience of a people in search of home. Michael J. Rosen has written many books for children, including the critically acclaimed Elijah’s Angel, The Cuckoo’s Haiku, and The Tale of Rescue. He lives in Glenford, Ohio. Robert Sabuda is internationally acclaimed for his stunning pop-up books, including America the Beautiful and The Twelve Days of Christmas. He lives in New York City. Robert Sabuda, master of the modern pop-up book, teams with poet Michael Rosen to celebrate a 2,000-year-old miracle. What happens when an acclaimed poet and the world’s best pop-up illustrator team up to create a Hanukkah masterpiece? They create this riveting and exquisitely beautiful book that must be seen and held to fully appreciate.